FFWPU Northeast: In order to strengthen our activities and raising up proud leaders in our region, Regional President Rev. 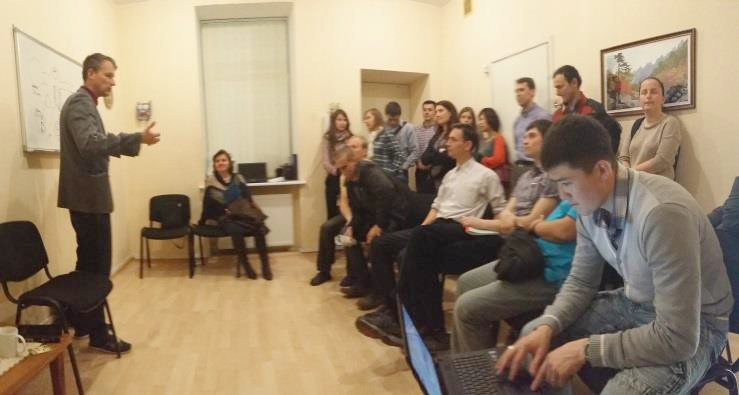 Chung organized a 21-day Leadership Training Workshop which took place in Ukraine, Kiev from April 10 to April 29. Thirty leaders and members with leadership potential gathered in Ukraine in the Yellow Castle, a house which was recently dedicated to God by Ukraine members. Leaders came from 9 nations Russia, Ukraine, Lithuania, Moldova, Belarus, Georgia, Azerbaijan, Kazakhstan and Mongolia. Our goal was to develop passion, determination and ownership for all the participants in their life of faith and hard work. Therefore all participants in a roll had to experience being a leader of the workshop. They had to lead pledge service in the morning, being MC, organizing cleaning, etc. For the success of witnessing in NER and this workshop in particular every morning all leaders did 120 full bow jeongseong condition and prayer. HoonDokHwe was from the book “The Way of Spiritual Leader.” The program of the workshop was very diverse. Participants had a chance to listen lectures from the prominent leaders and professors as well as they had training of practical skills necessary for leader. Rev. Chung paid special attention for this workshop. He stayed with participants most of the days despite his busy schedule. Every day he gave guidance about importance of jeongseong, which is like breathing for physical body, necessity to gain real experience with spirit world and making utmost efforts to gain a mind and body unity. Without this foundation it is impossible to become a spiritual leader. Special Emissary to Asia, Dr. Robert Kittel gave lectures on Divine Principle in a way understandable for general people without using too much religious terminology, which is quite effective in our region. And later he coached participants to give such presentations. Participants not only listened to the lectures but for few days had lecture and sermon practice. After one or two hours of preparation they had to speak in front of their groups, then each group participant gave evaluation of a speech using SWOT tool. Many members shared that such practice was very useful because they could see themselves objectively. Also participants had a chance receive lectures from Prof. Lee Jae Il about fundamental aspects of our faith and leadership. They also watch documentary about Jewish education showing how Jewish were able to preserve their tradition until now. This is very relevant for our movement today when we are aiming the goal of establishing eternal tradition of CheonIlGuk. During the workshop particpants practiced fundraising and witnessing in the streets of Kiev. Especially witnessing was very exciting. And during two days they invited 32 new guests to the introduction lecture, few of them already listened to 1-day seminar and expressed desire to participate in 2-day and 7-day seminar. The witnessing center in Kiev was a truly international, center where participants from 9 nations plus Cheon Il Guk missionaries from Korea and Japan were working together. This generated an incredible spirit of unity. At the workshop leaders really faced their limitations and gained strength to challenge them. Several members who are not leaders yet remained in Ukraine for more training of giving lectures and witnessing. Through this workshop leaders could break down their national concepts and develop mind beyond their nations. They could create real unity on the continental level and could practically feel that we are one family under God.